A leaked document reveals that an NHS England Trust knew of failings 10 months before a young man died in its care. 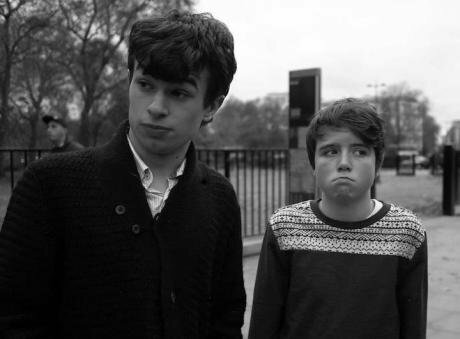 Tuesday morning brought fresh shock to the family of Connor Sparrowhawk, a quirky, funny young man who drowned following a seizure in a bath at an NHS facility nearly three years ago. On Tuesday Connor’s mother, Sara Ryan, received a copy of a leaked NHS document, dated August 2012, that noted failings at the facility, failings that might have set alarm bells ringing a full 10 months before Connor’s death. Late last year an inquest jury at Oxford Coroner’s court determined that Connor, who had learning disabilities and epilepsy, had drowned following a seizure in the bath at the Southern Health NHS Trust unit knows as STATT (short-term assessment and treatment team) in Slade House, at Headington, near Oxford. He was 18 years old. The jury said that Connor’s death, on 4 July 2013, had been “contributed to by neglect”, that there was a lack of training and leadership at the unit and poor communication between staff and the family. 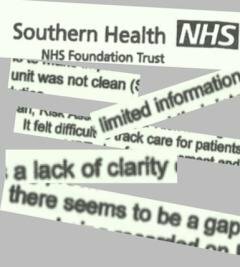 The document leaked this week, dated 22nd August 2012 and headed “Quality and Safety Review Update”, suggests that Southern Health NHS Foundation was aware of failings at the unit 10 months before Connor died and three months before they officially took over the provision in November 2012. Among detailed criticisms of the short term assessment unit, the document notes a “lack of clarity” in patient care plans. It was “difficult to track care for patients, identify the reason for admission”. (Or rather, it noted: there “seems to be a gap”. 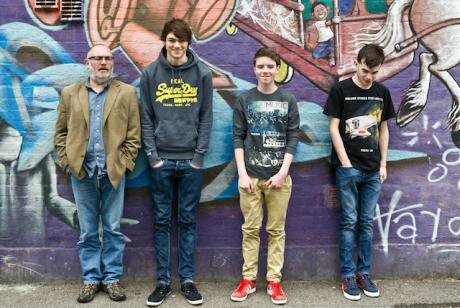 Either there was or there wasn’t a gap. The lack of clarity and rigour in the document itself is revealing). Clinical team meetings, held each week, lacked information. Staff were aware that there had been an audit of care plans on the RiO system, but “they were not aware of any results or action plans to make improvements”. This is only the latest in a series of shocking discoveries for Connor’s family, who were initially informed by Southern Health that he had died of “natural causes”. Connor’s mother Sara Ryan has recorded on her blog that during the inquest “the big shocker (and there were several)” was the revelation on Day 4 that a patient had died in 2006 in the same bath in which Connor drowned. In the aftermath of Connor’s death, and in response to his family’s relentless campaigning, NHS England commissioned an audit of deaths at Southern Health from the audit, tax and advisory firm Mazars. 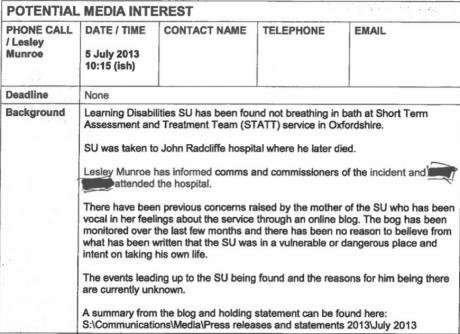 The morning after Connor’s death, according to an internal document dated 5 July 2013, Southern Health took the trouble to note “potential media interest” in the incident. That document holds yet another disturbing revelation. The Trust that so thoroughly failed to safeguard Connor Sparrowhawk had, for months, devoted time and resources to monitoring his mother’s blog. • Sara Ryan blogged throughout Connor’s time at Slade House and has continued to do so since Connor’s death. Here is her blog. 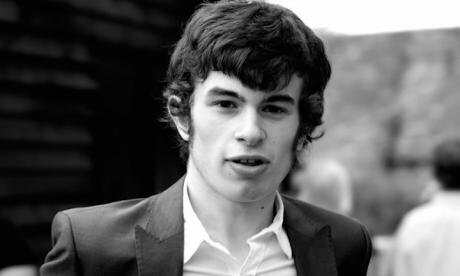 • Connor Sparrowhawk’s family is supported by the charity INQUEST, and represented by INQUEST Lawyers Group member Charlotte Haworth of Bindmans solicitors. • Details of the Care Quality Commission inspection report of November 2013 can be found here.